How cold is the water in Silfra? The water temperature in Silfra is 2-4°Celsius all year around. This converts to 35-39°Fahrenheit. Below you find our collection of frequently asked questions. If you are unclear about certain issues related to your tour or our services, we recommend to you to browse through the list and see if you find some answers to your questions here. Are photos always taken on the Diving Day Tours? Our dive guides carry an underwater camera on most dives in Silfra and other dive sites. The dive guides try to take as many great underwater photographs as possible on these dives. However, safety comes always first and it can occur that the dive guide chooses to not distract him-/herself from dive safety on particular dives in difficult conditions or with insecure divers. In that case it might happen that few or no photos are taken. We hope for your understanding should this be the case. Usually the photos of the dives are available for purchase after the dive tour. Please check out our Souvenir page for more info. Can I bring my own camera on the Drysuit course? Unfortunately, PADI dive training regulations prohibit both the dive instructor and the students from carrying a camera of any sort during training dives. As we are a PADI 5 Star Dive Center, we respect these regulations. Can I bring my own dive equipment? Yes of course! You are welcome to bring your own dive equipment to Iceland. By bringing a full set of dive gear excluding scuba tanks, dive weights, dive masks and fins you will receive a ISK 5.000,- discount of your diving day tour. Please make sure that your dive equipment is serviced and rated for cold water diving. As a standard we use DIN cylinders; please let us know in advance if you require a different set up for your dive equipment and we will do our best to satisfy your request. Can I take the PADI Dry Suit Diver Course and dive Silfra? To dive Silfra you are required to have either a drysuit diver certification or drysuit dive expereince. We have therefore created a 2-day Drysuit and Silfra Combo Tour. During this tour, you will complete your PADI Dry Suit Diver Specialty Course on the first day and, upon completion, participate in the Diving Silfra Day Tour on the second day. Do you ever not catch anything on the Freedive Foodhunt? The Foodhunt has up to now always resulted in a bounteous catch! Sometimes this might not include a fish, but you'll almost certainly be able to gather mussels or other types of shellfish. 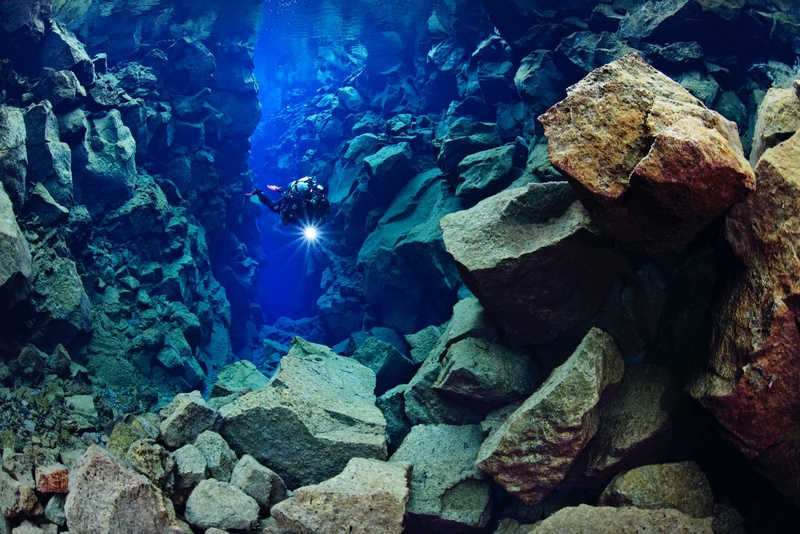 Do you guarantee 2 dives on the Silfra Day Tour? We always try to do 2 dives. If the air temperature drops below 0°Celsius / 32°Fahrenheit, we do only one dive due to safety reasons (the equipment will freeze after the first dive). This happens usually in the winter season only. How deep are the Silfra dives? The maximum allowed dive depth in Silfra is 18 meters / 60 feet, however the average depth of a typical Silfra dive is about 10 meters / 32 feet. Depending on the dive qualifications and dive experience of the divers, the Silfra dive might be shallower for safety and convenience. Due to the geography of Silfra, our entrance and exit points are at different locations. The car park is located approximately 100m from the entrance point and the walk back from the exit is approximately 350m. If you are struggling with the walk, please let your guide know and they will be happy to help you. Equipment can always be left behind and collected later. How long are the Silfra dives? Each of the Silfra dives is usually between 30 and 45 minutes, depending on air consumption, diver ability and customer comfort. How long is the Silfra Diving Day Tour? The duration of the Silfra Diving Day Tour is very dependent on the number of participants and their dive experience level, and as such we are unable to give a definitive time, but usually the tour time is around five hours at Silfra. If however you are planning another activity straight after your dive tour, please allow a maximum time of 6 hours for the Silfra Diving Day Tour. If you are using our transport then your total time of your Silfra Diving Day Tour is estimated to be a maximum of eight hours from pick up to drop off. I forgot my certification card. Is there any way to look my certification up online? 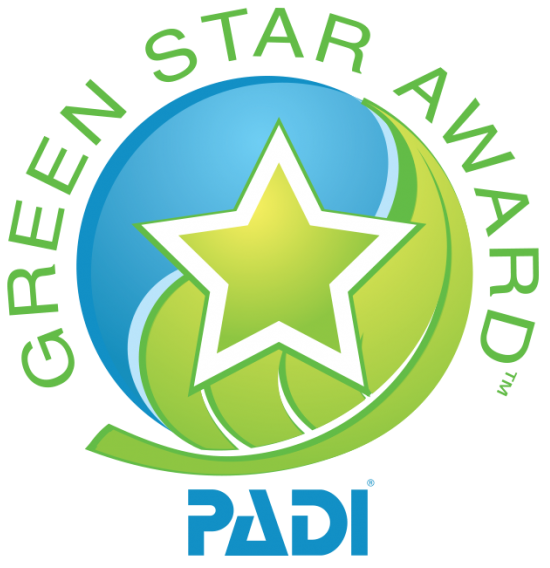 If you are PADI or SSI certified we can often look you up online. We need you full name (incl. middle name) and your birth date, as it appears on your certification card, before the tour starts. Please be aware that both PADI and SSI sometimes have glitches in their website/data imput, which results in your records not being findable. If you are certified with any other organization, we are unfortunately unable to look you up. In either of these cases you will not be able to participate. It is therefor best to always carry your dive cards, or to sign up for PADI e-cards, which are stored on an App on your phone. If you have only recently certified, the temporary card that is emailed to you by your instructor is acceptable proof. I have a Dry suit certification but I don't have 10 dry suit dives, can I still dive with you? 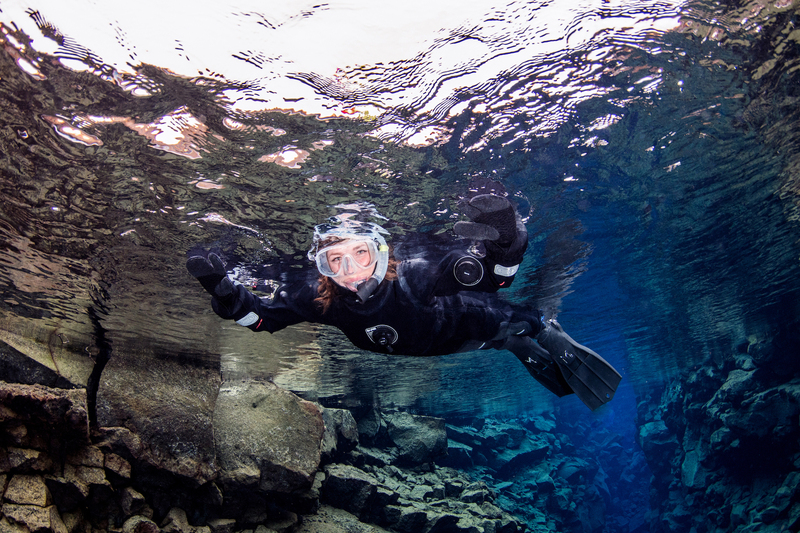 To dive in Silfra you need dry suit certification OR a minimum of 10 logged dry suit dives within the last two years. You don't need to meet both of these requirements, one is sufficient. What if I only want to do a single dive? Does it cost the same as a double dive tour? Unlike many other dive centers around the world that charge tour prices per tank, our tour price is calculated per tour due to the Icelandic weather conditions. Our tour always includes one dive, but we try our best to do a second dive when conditions allow it. For that reason, there is no price difference if you wish to only do a single dive when there is a possibility of a second one. What is the best time of year to dive Silfra? There is no best or worst time to dive Silfra. Every season and every weather has its advantages. A calm and overcast winter day will be amazing with beautiful reflections in Silfra´s water surface. A windy summer day with waves will cast sun ripples onto the Silfra bottom... a sight you will never forget. Generally in the summer there are more snorkelers & divers at Silfra, so the winters are calmer, but winter surface conditions can also be more challenging in regards to weather and cold. What type of dive certification(s) do I need in order to participate in one of your scuba dive tours? be at the level of PADI Open Water Diver or above. Equivalent dive certifications from other dive organizations are sufficient. have a dry suit dive certification OR 10 logged dry suit dives within the last two years of the dive tour date and be able to provide written proof from a diving instructor of these dry suit dives. Why are there limitations to the diving? Silfra is located in the National Park and as such it is subject to restrictions put in place by Icelandic law, which require all divers to be a minimum of 17 years old, hold at least an Open Water Certification (stating you can autonomously dive to at least 18m) or higher and have either a drysuit certificate or experience. It is also forbidden to enter into any overhead environment, regardless of training, or to dive deeper than 18m. Our other sites, are subject to the minimum age limit by law, and we require drysuit expereince for them, because they are fragile aquatic environments and have sligthly harder conditions than many other dive sites around the world. Why do I need to fill out a Diving Silfra Medical Statement? Every diver joining our Silfra Diving Day Tour needs to fill out the Diving Silfra Medical Statement to make sure that he/she understands the difficulties and risks associated with the Silfra dives as listed on the left hand side of the form and by completing the medical questionaire on the right hand side of the form the participant confirms that he/she is fit and healthy to join the Silfra Diving Day Tour. This is done so that all divers enjoy a safe and happy dive tour. Are photos always taken on the Silfra Snorkeling Tours? In general the answer is yes. However, it can happen in rare occasions that your Silfra snorkeling guide is not able to take photos because he/she might be busy assisting other snorkelers in the water. Another uncommon reason could be that the camera has a problem. In this unlikely case you will be refunded for the tour photos should you already have purchased them online in advance. Can I free dive/duck dive while snorkeling in a dry suit? You can try :) However our dry suits are very buoyant and won't let you sink. Due to safety reasons we unfortunately do not provide weight belts. Few people are able to free dive in these suits, most are not. You are more than welcome to try, but please be aware that moving around that much and at extreme angles will raise the risk of water entering your dry suit through the neck seal. For those of you who are enthusiastic freedivers, we also offer freedive tours of Silfra through our trusted partners who are specialists in freediving. These tours are conducted in a wetsuit, which makes freediving possible. Can I use my full face snorkel mask? Can I use my own snorkel equipment? You are most welcome to bring your own snorkeling equipment, but please be aware of the following. If you are thinking of bringing your own fins, please make sure that they are open heeled fins, as they will need to fit over a drysuit boot. Most people will wear a drysuit with similar sized shoes to their normal shoe size, but sometimes that is not the case, and therefore your fins may not fit. If you have your own neoprene hood and gloves, you are welcome to bring them, but please remember that this is 3°C water - we highly suggest a minimum of 7mm hood and 7mm three finger mittens as these are the warmest options, and what we will supply. You may find that 5mm five fingered gloves are quite cold, and we do not advise wearing anything less than 5mm thickness. Do I need to be able to swim in order to take part in Snorkeling? Even though the dry suits are very buoyant and keep you afloat, it is a requirement that all participants must be able to swim and feel comfortable in water to join the tour. This is for your own safety and comfort. You do however not need to be a very strong swimmer, merely able to swim and be comfortable in the water. How long are we in the water? During our snorkel tour we are in the water between 30 and 45 minutes, depending on the speed that the group travels and how long they want to explore in the lagoon at the end. How long is the snorkel tour? The tour time is between 2 and 2.5hrs from start to finish at Silfra, not including pick up and drop of times. The speed of the tour is dependent on the participants in the group and the number of people at Silfra, so if you are planning a second activity afterwards, please work on a maximum time frame of three hours. Please note that this is the duration of the tour on site at Silfra. If you have chosen to use our transport options, your tour time will be between five and six hours from pick up to drop off. Are the dry suits very tight / uncomfortable? We use top quality equipment for our Snorkeling and Scuba Diving tours. The dry suits only do a certain amount of dives / time before they get sold and replaced by new ones. This ensures that our guests will always dive/snorkel in top notch dry suits frequently tested, serviced or replaced. However, it is of high importance to provide us with your correct size (height and weight), so we can make sure to bring the best fit for you. If we receive an incorrect size, the guest will receive and incorrect dry suit fit. We assure you that your size information as well as all other personal information stays confidential with us. We also want to point out that if you are sensitive to having something tight around your neck and/or wrists you might feel uncomfortable in a dry suit. It goes with the territory to have a well sealing neoprene neck seal and rubber wrist seals in order to stay dry. Do you have prescription masks? Unfortunately we do not offer prescription masks, due to the amount of prescriptions we would need to cover. If you use glasses we recommend that you bring contact lenses as the glasses do not fit under the mask. If you do however own a prescription mask, you are of course welcome to use it on the tour. Unfortunately, we do not offer any life jackets on our tours. All our participants must be able to swims and feel comfortable in water. What type of gloves do you use? We provide you with 7mm three fingered neoprene mittens. This work on the same principles as a wetsuit, so your hands will be wet, but very well insulated. Will I get cold while freediving in a wetsuit? The wetsuit used by our partners on the freediving tour is a specialized 7mm freediving suit. In many cases, no water will touch your skin, but if it does, your body quickly heats up the water. It's important to remember that the Silfra freedive tour is a tour in 2°C water, not tropical warm waters, so your expectations should be adjusted accordingly, but most people are perfectly comfortable in the water using the specialized freediving wetsuit. The Freedive Foodhunt will take you on freedives in the ocean, which is several degrees warmer than Silfra. Are there any Souvenirs available? Yes, we offer a variety of Souvenirs of Silfra and DIVE.IS including photo packages, t-shirts, jumpers, hoddies, hats , logbooks, postcards and stickers. Please have a look at our Souvenir page for more detailed information. Are there toilet and changing facilities available at Silfra? Yes, there are toilet facilities at Silfra. However we kindly ask you to not use them for changing, as there are only 2 toilets at Silfra and it can cause long queues to form. We do have a changing room vehicle, and often several other cars at Silfra for participants to change clothes in. Due to this layout, we highly recommend that participants arrive at Silfra already wearing their thermal base layer. Can I bring my GoPro,waterproof camera or phone on tour? Of course! You are free to take your own photos or video on tour with us, but we ask that your equipment is attached to your body in one way or another, for example with a wrist band. We do however not advise that you take your phone in a waterproof case, due to the fact that it is generally not possible to operate it whilst wearing the gloves. Make sure that you read the instructions that come with your photography equipment of how deep and/or cold you are allowed to take it underwater, we strongly encourage you to follow them thoroughly. We do not take any responsibility of lost or damage photography gear that may happen on tour with us. Can I buy food at Silfra? Unfortunately, there is no food sold directly at Silfra. There is however a restaurant at the Thingvellir Information Centre which is located just 3,5km away from Silfra. Can I have a German (or any other language) speaking guide? Our company policy is that all participants must be able to communicate in English as that is the working language of our guides. We are happy to accept a non-English speaker, as long as they have an English speaker with them who can translate for them. This must be at a ratio of no more than 2 people to a translator. The translator must participate in the in-water activity. If this is not possible, you may contact us and ask, as we do have very multi-lingual guides and are happy to discuss the possibility of a private tour (at additional cost), but it cannot be guaranteed. Can I pay on site? All bookings need to be paid for in advance, due to high demand on our tours. If however a booking is made on site, the payment can be taken there either by credit/debit card or cash. Payment for souvenirs can be made on site by both card and cash transactions. Can I wear my jewellery? Small stud earrings, non removable piercings and narrow chain necklaces can be worn without any problem. However bracelets, watches, chunky necklaces and dangling earrings need to be removed. With regards to rings, they can be worn without any problem, but we ask that rings with large stones are either removed, or twisted around to the palm. Rings with sharp edges are best removed so they do not catch on the gloves and wrist seals. Can my child wait on the surface while I snorkel/dive? Silfra is indeed very beautiful. However it can be very dangerous for kids left unsupervised. There is unfortunately no child care at Silfra and no staff member who can take responsibility of them. We advise you to bring someone with you that can be with your kids during the activity. Can my children dive? They are under 17 years old and certified. Unfortunately, by Icelandic law, all divers need to be a minimum of 17 years old to dive in Icelandic waters. Our company does however allow 17 year old divers who are certified with a Dry suit and diving speciality to join our tours with accompanied by their legal guardian. Please note that their legal guardian will need to sign all paperwork for them. Can my family join the boat? Silfra is accessed from shore, so there are no boats involved. Your family can of course stay with you on the surface and walk with you to the entrance and exit point. Can my travel companion come with me on tour without participating in the tour? Yes of course. We offer a special passenger fee of 9.990.-isk. Please note that you need to book this via email. If you are driving yourselves to the national park your companion can join for free as there is no entrace fee to the national park. Do I need a towel? Do you provide them? We unfortunately do not offer towels on our tour. You will only get wet on your head and hands so a towel is not really needed. You are however more than welcome to bring your own, and if you have long hair you might want to bring a towel to dry it after the tour. Do I need to pay for parking at Silfra? The Þingvellir National Park charges a parking fee (750,- ISK for a passenger car ), which allows you to park in any of the five car parks in the park for the duration of the day. Please note that the parking lot for divers and snorkelers at Silfra is called P5 and is about a 5 minute walk to the Silfra meeting point. You can pay for parking online at www.myparking.is before or during the day of visit, and enter the license plate of your car into the system. Cameras check all license plates entering and leaving the parking lots. If you can’t pay online , you can pay at the Visitor centre. Pay machines will also be installed at the parking lots in near future. The pay machines accept all major credit/debit cards. Do I need to see a doctor before I join your tour? Do you offer photo packages from the dive and snorkel tours? Do you rent out underwater cameras? Unfortunately we do not offer cameras for rent, we do however offer a very reasonably priced photo package including photos taken by your guide during your tour, and access to our "Best of Silfra" collection. You are however welcome to bring your own waterproof camera. Do you see any life in Silfra? Although there is plenty of life in Silfra, most of it is either plant life or microinvertibrates, which are not visible with the human eye. Silfra is home to a unique amphipod called Crymostygius Thingvallensis found only in Thingvellir Lake and the surrounding fissures, such as Silfra. With regards to fish life, there are three different species of fish that live in the lake: Brown Trout, Arctic Char and Sticklebacks, however, only the Arctic Char visit the fissure; they are frequent visitors during mating season in August and September. Throughout the rest of the year, the only fish who live in the Silfra fissure are the Dwarf Char, a subspecies of the Arctic Char. These range in size from a few centimetres, to approximately 10cm maximum, and live down in the darker recesses near the rocks and as such are not often spotted by divers or snorkelers. Do you sell gift certificates for your Silfra tours or dive courses? Yes, if you want to give someone a nice present, it will be our pleasure to prepare a nice gift certificate for you. The certificate can be made for all of our tours, courses or any other products you find on our website. Please do not hesitate to contact us with your ideas. How can I pay for the photos? The photo package can be paid for with either cash or debit/credit card, on site with your guide. If you decide at a later date that you would like to purchase the photos you can contact our office and a payment link will be sent to you, allowing you to pay online. Your hair is best worn either loose or in a low ponytail or a braid. This keeps it nicely out of the way during the activity. We do not advise buns or high ponytails as they will be quite uncomfortable under your hood, and bunches or twin braids can make a dry suit removal more difficult. Please be aware that your hair is going to get wet, so please bring a towel if you prefer drying your hair afterwards. I already paid the 1500.-isk entrace fee, how do I enter the park? The Silfra fee is only for customers entering the water in Silfra. There is no entrance fee into the National Park itself. I am allergic to latex and/or neoprene. Is this a problem? Our suits contain both neoprene and latex, so we ask that you contact us before completing your booking to discuss your situation and arrange for alternative equipment if possible. I am diving and my friend wants to snorkel, is that possible? Yes of course! Our dive and snorkel tours are 30mins/1 hour apart, so please choose the tours that are the most similar in timing. However, if you need transportation from Reykjavík we can unfortunately not pick you up together in the same van do to different times and regulations. Also, please be aware that not all snorkel tours offer pick up. Once at the site, divers and snorkelers are split into separate groups with different guides, but it is a small area and you will surely see each other. Please note that National Park regulations do not allow divers and snorkelers to be in the same spot in the water at the same time, you will therefor enter the water at different times with different guides. I am legally blind/deaf, can I join your tour? You are welcome to join our tour, but we ask that you bring along a companion who is not legally blind/deaf and who will participate in the activity with you. This is for your own comfort and safety to make sure that there is someone who is familiar with your situation and in the case of deafness, who is able to communicate with you as we do not currently have any guides who speak sign language. We would appreciate it if you can let us know ahead of time in these situations, so that our guides are aware of the situation and so that we can discuss with you any particular changes or conciderations that may need to be taken into account. I am taking prescription medicine, ie. birth control, can I join your tour? I tried to book but I can't put my correct height and weight in, why is that? Unfortunately our booking system only allows for a certain height to weight ratio. We have a specific height and weight requirements for our dry suits in order to ensure the safety and comfort of our customers. If a body size does not meet these requirements, it is unfortunately not possible for us to ensure that the dry suit will fit and/or it will not leak at the wrist or neck seals. I use glasses, is that a problem? Unfortunately it is not possible to wear glasses underneath the dive mask, as the mask would fill with water. We therefore advise that if you are near-sighted (i.e. you need glasses for distance), that you consider wearing contact lenses or bring your own prescription mask with you. If you are snorkelling and have prescription swimming goggles you are able to wear them, but you must also bring a nose clip to close of your nose, so that you are able to use your snorkel. If your prescription is not very strong (up to approximately -4) you may find that the natural magnification of the water will still allow you to see quite clearly. Should you need to purchase contact lenses, there are several opticians in Reykjavik where you would be able to do so. Is food included on the day tours? We offer hot chocolate, tea and cookies after the dives and snorkels, but do not provide any other form of food. There is also drinking water on site. You are however welcome to bring your own food and drink with you and are allowed to consume it in our vehicles. We kindly ask that you have eaten breakfast/lunch before your tour, as you will need the energy it provides. If you have not had a chance to do so, please let our guides know when you are picked up and they can make a stop at a convenience store so you can pick something up. Is there anything to see around Silfra? Silfra is located in Thingvellir National Park, one of the main sites of the Golden Circle. It is a stunningly beautiful area as well as being one of Iceland's most important historical sites. There are many walking trails around the park and close by Silfra, and many of the areas have information signs telling you about the historical & geological aspects of the area around Silfra and Thingvellir. Is there somewhere to leave my valuables? My payment won't go through, do you not take AMEX? Unfortunately we do not accept American Express or Diners Club credit cards. Please try again with another card, if you still have problems please send us an email and we will find a solution. What is the best GoPro mount to use? When snorkeling you are able to use any form of GoPro mount, but please be aware of what angle it will put your GoPro at. On a head mount it often occurs that you are filming just above the surface and on a chest mount you only film striaght down. For best control, a stick mount or wrist mount gives you a full range of angles. When diving, a head mount allows you to have your hands free to control your dive equipment and we are able to secure it using your mask strap for extra security; it also allows a good range of angles as it will film wherever you look. A chest mount however is not advised as it is very difficult to attach it away from your drysuit inflator and BCD straps. Again a stick mount or wrist mount are good, but please remember that your priority is to operate your dive gear safely, so you need to be able to let go of it as well if you need your hands. Most importantly is tha tyour GoPro has some form of mount attached to it. Please do not bring it as just the camera unit, as it needs to be attached to you in some way. We are able to help to a certain extent, but need to have something to attach the strap to, even if it is just some string. What is the weather in Iceland like? During the summer months (June, July & August) it's sunny and warm(-ish) or overcast and wet, and often somewhere in between. The Icelandic weather famously changes at the drop of a woolly hat. So be prepared, bring your sun screen and short as well as your all-weather gear. Even in the middle of summer the temperatures can get low (to below 10°C at night) so a good fleece - or better yet, Icelandic wool - will be essential, along with a hat and gloves. Every time of year has its own benefits. It is least crowded in spring and autumn and you will often have a full range of activities available to you, but with less people than in summer, which is of course the busiest season here in Iceland. Winter has its own beauty and should not be dismissed, although it is not for the faint hearted as the weather can get quite extreme, and you would need to be flexible with your plans as tours can end up getting cancelled due to the weather. It is however the time for Northern Lights, so pros and cons as always. Please also be aware that winter lasts much later into the year than in most countries and there is often still snow in March and April. From a dive and snorkel point of view, it makes little difference which of the seasons you visit as our groups are small and the dive sites, visibility and marine life are pretty constant through out, varying more from day to day, than from season to season. The ocean temperatures are warmest, however, in summer and fall – about 8-12°C. For our other dive sites, such as our geothermal site and some of our other inland sites, are also warmest in summer and fall, although at a lower temperature, 6-8°C. Silfra however retains a constant temperature of 2-4°C. Where do I pay the entrace fee to the National park? There is no entrance fee into the National park, just into Silfra. The 1500.-isk Silfra fee is included in our tour prices, so you can enter the park and Silfra with out any problem. Our dive shop is located at the western end of downtown Reykjavik, a 20-30 minute walk from most of the city centre. We are happy to welcome you here between 9am and 5pm every day of the week. Why do I need a strap for my camera? To insure that you do not drop your camera. You will be wearing very bulky gloves, which can make it harder to operate your camera equipment. Dropped cameras and such items often fall between the rocks on the bottom of Silfra, making it difficult if not impossible to recover them. Can I get a pickup/drop off at the Blue Lagoon or Keflavík Airport? 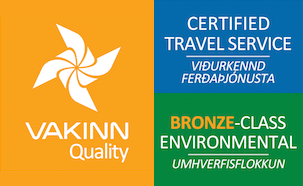 We do unfortunately not offer transportation outside of Reykjavík central area. If you are however going to/coming from the Blue Lagoon or Keflavík Airport we can pick you up/drop you off at BSI bus terminal in Reykjavík. Can I get a ride only one way? How much does it cost? If you wish to get transportation only one way that is fine. However the price stays the same, 5000.-isk, for the transportation as we have limited car space and we need to make sure there is a free spot in the car. So you have to pay both ways to reserve your spot. Do you pick me up at my hotel or do I need to come to a pick up point? We will either pick you up at your hotel in central/downtown Reykjavik, or, if you are staying on either Hverfisgata or Laugavegur we will pick you up at a designated pick up location If you are however staying outside of Reykjavik, you will unfortunately need to arrange your own transport into Reykjavik, preferably to the BSI bus station, where we will then pick you up. You can then of course also meet us in the National Park Thingvellir if you have your own transport. How do I find the meeting point? Silfra is located in Þingvellir national park, which is about 45-60 minutes drive from Reykjavík city. You can see a map attached to your ticket, find the map HERE or simply type Silfra Diving into Google maps. If you get lost on the way please do not hesitate to call our office for help. How far is it to Silfra from Reykjavik? It is about 60 km from Reykjavik to Silfra and it takes a little less than one hour to drive the distance by car, given the weather conditions are good. 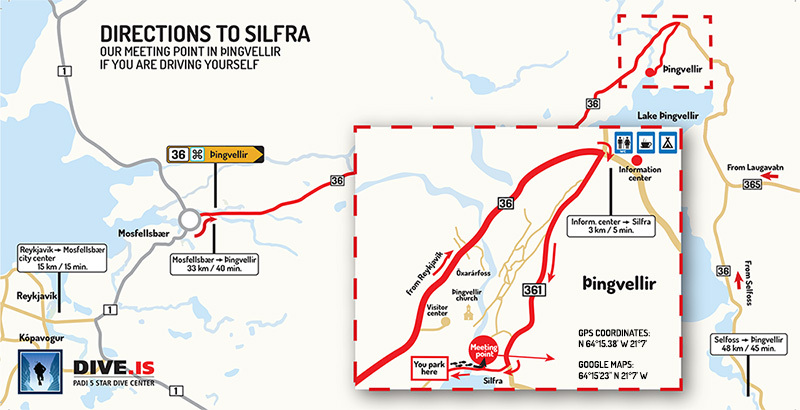 If you choose to drive to Silfra yourself and don‘t know the way, we recommend you to study the map before you hit the road. Silfra is located in Þingvellir National Park, which is a bit different from other national parks. At a point, when you turn into road 36, you will feel like you are driving into the middle of nowhere. Please do not turn around, just keep going straight until you see our company cars which are parked at the Silfra Meeting Point, you then drive a little further to parking lot P5 to park. If at anytime you feel lost please do not hesitate to call our office for help. Can I still join your Multiple Day Dive Tours or Dive Expeditions if I haven´t dived in a long while? Depending on your previous dive experience and level of dive training, if you haven't dived for a period of six months or more and are feeling a little rusty, we would suggest you do a refresher dive course prior to departure. 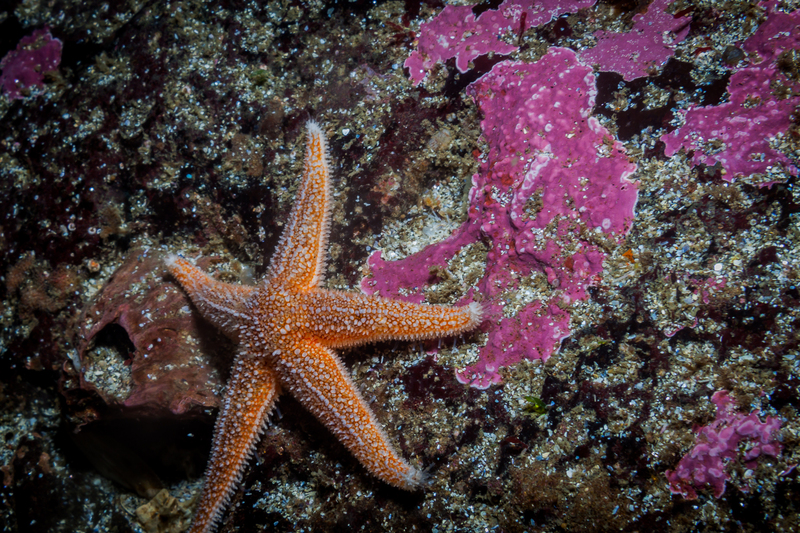 While Iceland is known for it´s crystal clear and calm fresh water dive sites, some of our dive sites are deep, others have strong currents or sometimes low visibility. Those are the reasons we usually do require that our divers have a minimum of 4-10 logged dry suit dives and a total of 30-40 logged dives, depending on the dive tour. My partner doesn't dive. Can she join me on a multi-day dive tour in Iceland? Of course! Given Iceland's extreme – and extremely beautiful – nature, we go to great lengths to provide our guest with as many opportunities as possible to sightsee along the way. All our multi-day dive tours include a considerable amount of scenic stops, photo-ops, and travel between dive sites through stunning landscapes. What are your health requirements for joining your Multi-Day Dive Tours? As with any dive tour – or indeed any dive – anyone who´s reasonably fit and healthy is usually good to go diving. In case you´re not sure we suggest to consult a (dive) doctor for a check-up before booking a dive tour. At any rate, you will be asked to sign a medical statement and liability release whereby you take responsibility for your own fitness to dive. What clothes/equipment do we need to bring on your Multi-Day Dive Tours? In terms of personal gear, all your regular travel kit, plus some warm, wind and water proof clothing. Even in the middle of summer the temperatures can get low (to below 10°C at night) so a good fleece – or better yet, Icelandic wool – will be essential, along with a hat and gloves. Also, while we tend not to get heavy, sustained rain, our summers can see their fair amount of precipitation, therefore you´ll need some form of rain protection to keep you dry between dives and on our sightseeing stops. It is important to have strong shoes, for example hiking boots, as much of the terrain in Iceland is uneven and rugged. And on our 5 and 10-day tour you will have access to a hot-tub at one of the hotels, so it is a good idea to bring swimwear. In terms of dive gear, most of our multi-day dive tour participants bring their own full sets of dive equipment. However, we do have a full range of top of the line dive equipment for hire at reasonable rates. Please contact us at diveexpeditions@dive.is for a price list. What type / size of scuba tanks do you use? We use steel tanks due to better buoyancy properties. We use both 12 liter and 15 liter bottles. We can also offer both single and double valves. Our valves have DIN connections, but if you bring your own regulator with a YOKE connection, let us know and we will bring a DIN - YOKE adaptor. Please let us know in advance which tank configuration you require for the equipment you bring, so we can have it ready for you. Can I wear my gloves? We advise that you bring gloves, at all times of the year, to keep your hands warm before you get in and warm them up after you get out of the water. This is especailly important in winter. However, whilst in the water, you will be wearing neoprene mittens that we provide for you. What do I need to wear? Do I need to buy a thermal base layer? It is best to come to Silfra already dressed in your thermal base layer as there are not many locations to fully change your clothes in private. If you do not have thermals and do not want to purchase any, something soft, close fitting and warm works just fine. For example, yoga pants, leggings, running tights and a long sleeved t-shirt or a thin jumper. Can we see Gullfoss and Geysir on the Laxness Horse riding and Silfra combo tour? How does my Horse Riding Combo tour work? If you have chosen our Silfra and horse riding combo tour, you will start with your trip to Silfra. A guide will pick you up at your chosen pick up location in town, and drive you to Silfra for your dive or snorkel. Afterwards, the guide will drop you off at your location down town , where you will be picked up by Laxness to join your riding tour. After your riding tour is finished, a driver from Laxness will drive you back to Reykjavik. Due to seasonal changes in tour times, the time you have between the two activities varies, but there is a comfy waiting area at Laxness Horse Farm, where you can buy drinks and hot soup and bread. You are also welcome to bring your own packed lunch and eat it there. How does my Lava Caving Combo tour work? There are two seperate Lava Caving combo tours, a self drive option and a pick up option. If you choose the self drive Lava Caving combo tour, you will meet your guides at Silfra and participate in the dive or snorkel first. You will then be met by your caving guide, from our sister company Basecamp, who will take you on the Lava Caving tour. After that tour, your guide will drop you back at the car park at Silfra, for you to collect your car. If you choose the other Lava Caving combo, then you will be picked up by our guides at your accomodation in Reykjavik and taken to Silfra to participate in your dive or snorkel. Afterwards, you will return to Reykjavik for a visit to the Volcano House, were you are invited to watch the films about both the Vestman Island and Eyarfjallajökull eruptions. Before or after the showing, you will have time to look around the Volcano House exhibition before your caving guide, from our sister company Basecamp, will pick you up for your Lava Caving tour. How long are we in the cave for? We are usually underground for 45-60 minutes, depending on the speed of the group. How long is the cave? We use 2 different caves on this tour, depending on the time of year and weather/road conditions. Gjábakkahellir cave in Thingvellir is 360 meters long and Leiðarendi cave in Reykjanes is 880 meters long. Is food included in the combo tours? Unfortunately none of our combo tours include a meal, although there are always hot drinks and biscuits after your dive or snorkel. On most of our combo tours there is however an opportunity to purchase food along the way. And of course you are always welcome to bring your own food and snacks. Is food included in the Golden Circle Tour? When do we dive/snorkel on the Golden Circle Tour? Please subsribe me to your newsletter.